The world’s best snicker-doodles. At least as far as I am concerned, and especially considering that my four year old can practically make them herself! This recipe originally called for half butter and half shortening, but using all butter makes for an amazing flavor that cannot be messed with. Preheat oven to 350. Mix flour, salt, and baking powder in a bowl. Using your paddle attachment on your stand mixer, mix butter and sugar until fluffy, roughly 2-3 minutes on medium. Add eggs one at a time. Bring the speed down to low and slowly add in the flour, salt, and baking powder mixture. Resist urge to eat. Use a cookie scoop to shape the dough into nice even little balls. Roll the balls into the cinnamon sugar. Again, resist the urge to eat raw cookie dough. Place on a cookie sheet about 2.5 inches apart and bake 12-15 minutes. Or just until the edges begin to turn golden brown. 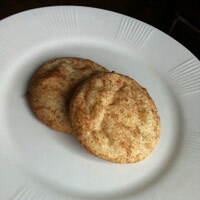 Let cool and enjoy the soft, succulent goodness of all that is a snicker doodle. If you’re feeling saucy, add a Snickers miniature to each cookie right when you bring it out of the oven. Super YUM!